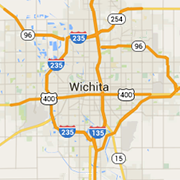 Wichita entertainment, sports and concert venue where every seat is a great seat! The social hub of the Wichita State campus. It is a place where students, faculty, staff, and the Wichita community all interact with one another on a daily basis. Indoor rock climbing and bouldering facility. Wichita, Kansas's largest rock climbing gym. Open to all ages and experience levels from beginners to advanced climbers. Wichita’s premier indoor go-kart racing experience. Our electric karts paired with our unique “grip n’ rip” asphalt track lets you race down the track at near 45 mph!